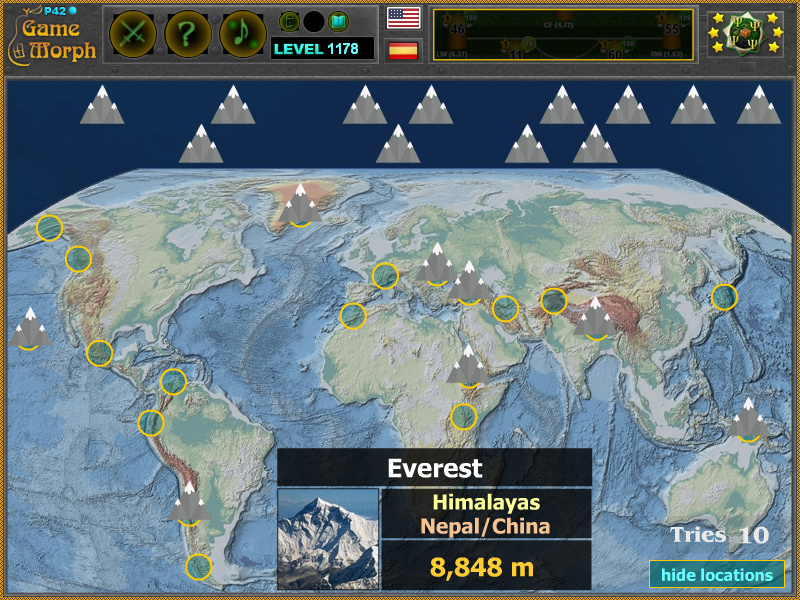 20 highest peaks in the world in a fun online geography learning game. "The Highest Peaks Puzzle" is a free online knowledge level game to sort the highest peaks in the world by promenance. It include one or two peaks from the largest mountain ranges, or else the 20 highest peaks should be just from the Himalayas. Free online game to explore, learn or test the highest peaks on the world map. Geography map game, suitable for online lessons and interactive classes. Minute to win it game. Everest - Himalayas - Nepal/China (Tibet) - 8,848 m.
K2 - Karakoram - Pakistan/China - 8,611 m.
Aconcagua - Andes - Argentina - 6,962 m.
Chimborazo - Cordillera Occidental - Ecuador - 6,263 m.
Denali - Alaska Range - United States - 6,191 m.
Mount Elbrus	- Caucasus Mountains - Russia - 5,642 m.
Pico de Orizaba - Trans-Mexican Volcanic Belt - Mexico - 5,636 m.
Mount Damavand - Alborz - Iran - 5,610 m.
Mount Ararat - Armenian Highlands - Turkey - 5,137 m.
Puncak Jaya - Sudirman Range - Indonesia - 4,884 m.
Monte Bianco - Alps - France/Italy - 4,808 m.
Ras Dashen - Semien Mountains - Ethiopia - 4,550 m.
Mauna Kea - Hawaiian Islands - United States (Hawaii) - 4,205 m.
Toubkal - Atlas Mountains - Morocco - 4,167 m.
Mount Waddington - Coast Mountains - Canada - 4,019 m.
Mount Fuji - Honshu - Japan - 3,776 m.
Gunnbjorn Fjeld - Watkins Range - Greenland - 3,694 m.
Lautaro - Andes - Chile - 3,623 m.
How to play The Highest Peaks Puzzle. There are 20 movable pieces with peaks on the top of the screen. Every peak have a name, a picture, mountain, country and height. Drag and drop them at the approximate location on the map. If the location is wrong, the peak will return to its original place. Know 5 of 20 highets peaks and get +1 Knowledge Level. Class subject: The highest peaks in the world. We all know, that Everest is the highest peak in the world. The name of the second highest peak is K2! Interesting indeed. So after 4 billion years of moving, we have the present continents, smushing one into another, to form some of the today's notable mountain ranges, where the highest peaks appear. The most amazing of them are the Himalayas, located at the bottom of China. They are home to the top 10 highest peaks in the world with Karakoram to the west. Which is the highest peak in the world? Where is the highest peak in the world located? What is the second highest peak in the world?